Another trip is in the books and was one to remember for a long time. The fishing was great and the catching was off the charts. The first afternoon was spent figuring out what the fish wanted, but once we discovered the hot combination things quickly improved. Fish would take a variety of nymphs the first day, but the clear favorite was a beadhead caddis pupa. On top, the fish were definitely interested in taking a Parachute Adams. I finally settled on a dry/dropper combo as the best way to consistently take fish. We kicked off the fishing portion of the trip after we set up our camp at Elkmont. Instead of wasting valuable fishing time driving somewhere, we just fished out of the campground, hiking either up or down the river. With me on this trip was my cousin Nathan and his buddy JR. Nathan fishes with me fairly often, but this was the first time fishing with JR. To make things even better, this was JR's first time fishing in the Smokies. Taking people out to a Smokies stream for the first time is always a great experience that I enjoy immensely. You watch their progression, beginning with them splashing through the stream spooking all the fish, to becoming a wily veteran utilizing every bit of cover and camouflage to approach the fish. JR had fly fished a little before so the casting was not a problem. He did just fine getting the fly to the fish and his reflexes were quick enough that he hooked his first fish within 10 minutes of getting on the water. Best of all he learned quickly. I never had to tell him twice to be sneaky. 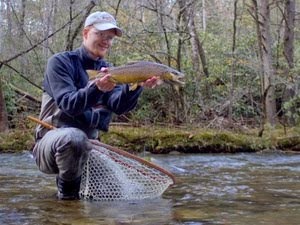 Stealth cannot be emphasized too much in trout fishing, and in particular this is true in the Smokies. My favorite tactic for putting someone new to the park onto fish involves a beadhead nymph and an indicator. For that matter it works great for anyone not accustomed to highsticking nymphs without an indicator. We all started out with nymphs simply because it was a bright sunny day. Trout tend to be a little skittish under these conditions and sit deeper in the water column. 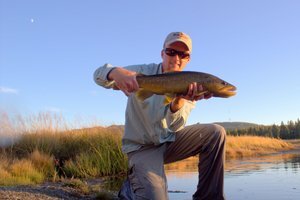 Of course, this time of year, you can almost certainly find trout willing to rise to a dry fly if you are willing to cover water. With both Nathan and JR both set up with nymph rigs, I was ready to fish myself and tied on a double nymph rig. Once I get people catching fish, I start experimenting with patterns, quickly cycling through patterns that will likely be catching fish at the given time of year. Currently yellow stoneflies are starting to hatch and of course there are still plenty of mayflies around. Additionally, the caddis should really be turning on shortly now. The mornings feature an excellent midge hatch. If you know what time of day each of these insects are active, you can maximize your efficiency in catching fish. I cycled through most of the standard patterns that usually work well for me this time of year. While all the flies caught fish, I still felt that things could be much better. Finally I tried a simple little caddis pupa with a beadhead. Immediately I started catching fish. At first I thought it was a fluke, that is until I moved into a small pool no larger than 15 x 20 feet. Every cast resulted in either a hookup or a missed strike. By the time I had pulled out 5 or 6 fish, I knew that I was onto something. Each fish hit the same pupa pattern. The best brown trout caught the first day came from this pool. Quickly digging through my fly boxes, I found a few more so Nathan and JR could get in on the action. Moving together upstream, one on each side and one observing, we started to nail fish left and right. After an hour or so it was getting towards dark. We fished up to one last pool, in the process catching a few more fish. As we were leaving the first mayfly spinners were making an appearance, and the fish started rising enthusiastically. On the hike out, I saw fish rising in every pool and soft pocket. Arriving back in camp, we built a huge fire and did the traditional hot dog roast. Sitting around the fire, we shared stories from the day before finally hitting the sack. Saturday morning I got up early to hit a few pools below Elkmont in search of larger browns. Despite my best efforts, I never saw any truly large fish but had a good time looking. Before heading back to camp for breakfast, I fished a favorite pool and caught a few rainbows. Again, the bead head dropper was nailing all the fish. In camp, after eating a hearty breakfast, I pulled out my tying equipment and cranked out a dozen of the hot fly pattern. Assured of a good supply of flies, we headed out for another day on the stream. Our destination required a bit of hiking which is always a gamble. Someone could be on the water ahead of you spooking all the fish and causing your catching numbers to suffer. However, if you are the first one on the water in a few days, the results can be spectacular. We finally commenced fishing in a favorite pool of mine. Of course, I say that about most of the water on Little River. Still, I have had more good days in this area than any other stretch of Little River. I figured that it would probably produce at least a few fish for my less-experienced fishing buddies. What I didn't expect was how much the river would show off for us. I started fishing up the first run while Nathan and JR got into their wading gear. Generally I hike in ready to fish, but they packed their waders. Fishing to the head of the first pool produced five fish, and my excitement was growing exponentially. Most of the fish were on the dropper, but some were rising to the Parachute Adams as well. Once I got Nathan and JR fishing, they were immediately successful as well. Soon we developed an efficient rhythm. In stretches where it was easy to leapfrog, we spread out through a 100-200 yard section. Where the rhododendron crowded closer to the water, we fished directly across from each other in stealth mode, sneaking slowly along the edges and picking pockets for the brightly colored rainbows and occasional brown that took the caddis pupa with reckless abandon and kept rising often enough to insure that we stuck with a dry/dropper rig. In fact, by the end of the day, we all agreed that probably half of our fish came on the dry flies. There were many highlights throughout the day, but one of the best was when Nathan caught a nice fish. I was busy helping JR to retie when I heard Nathan shout. When I looked up, I saw his rod bent and asked if it was a good one. The look on his face was priceless as he responded in the affirmative. Quickly finishing the knot for JR, I started wading back across the stream to help land the fish and take pictures. The trout started on a blistering run downstream with Nathan following in pursuit. 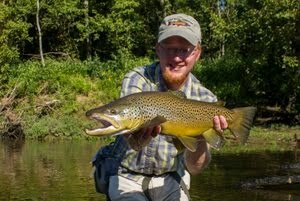 Finally, in some dead water behind a boulder we landed the nice brown. High fives were given all around and then we took a few pictures. The fish had put up a heroic fight so I spent some extra time reviving it. When it was rested, the fish took off quickly, hopefully to grow some more before we catch it again. Another highlight was when I happened on a pool where seemingly ever trout was out feeding. 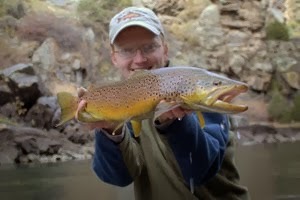 Before I was finished, I had taken 12 trout out of the pool along with my best fish of the weekend, a 12 inch brown. In the last pool of the day, Nathan and I caught 1o trout between the two of us. These are just two examples that give some idea of just how good the fishing was on this trip. Sometimes I enjoy just catching a lot of fish. Other times I am in the mood for a difficult fish or maybe a quality hatch. On this trip, I definitely got my fill of catching average Smoky Mountain trout. This is one of my favorite times of year. 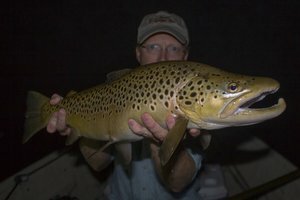 In the mountains the trout are rising to the best hatches of the season, and at the same time the warm water scene is heating up. This past week we had an outing for the guys at the school I teach at. There would be a small lake very close by so I took a couple of fly rods hoping to get a little fishing. Things worked out much better than I anticipated when a bunch of guys wanted to go swimming and I was assigned to be one of the people to supervise. Naturally I rigged up the two rods. At this point some of the guys were watching with a bit of interest and one came over and asked if he could try it out. I'm always glad to give my students a chance to try the sport. Last year's outing produced good results with the bluegill for all the students that tried fly fishing. This year I was a bit surprised by the fact that only one guy, Michael, was really interested in trying it out. We both strung up our rods, mine for bass and his for bluegill, and started to slowly make our way around the pond. I fished the first spot, all the while providing commentary on what I was doing and I. As I was bouncing my fly past some structure, a bass came out to inhale the offering. The guys were all impressed and I was happy. Last year we couldn't buy any bass on this lake so it was a good start. After getting a couple of pictures, we continued moving around the pond. I slowly worked ahead, constantly watching for fish and directing him to sneak up and cast when any were spotted. Still, the fish were very spooky and we were having a hard time getting close enough for his basic casting skills. Finally, we were about out of time. I stopped at a small bay and proceeded to pick up my third small bass of the day while he jumped in a canoe with another guy to take a shortcut back. As I was releasing my fish, I heard him shouting, "Mr. Knapp, Mr. Knapp!!! I've got one!!!" I sent back instructions to keep the fish in the water until I arrived and then hurried on around to where he was. He had a big grin on his face and a nice little bluegill. After helping him pose with the fish, I snapped a couple of pictures and then we released the fish. All in all, it was a great outing and hopefully another young person was converted to the sport.